Mainly made of aluminum alloy, very sturdy and durable. Max. load capacity is up to 8kg/17.6lbs. Two built-in bubble levels in different directions play an important role in balancing your camera and locating view finding. 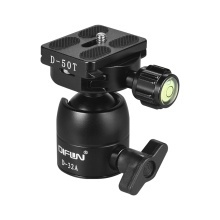 The D-50T quick release plate, with location pins and non-slip rubber pads, can effectively avoid your camera falling off accidentally. 3/8 inch screw hole at the bottom for tripod, monopod and 1/4 inch screw mount on the top applied to most cameras. One notch design can achieve quick switch between horizontal shooting and 90° vertical shooting. 32mm large sphere with stronger locking force make the ball head stable & smooth in operation.